Judith Roberts and Edna Currie produced the Greater Manchester survey in 1988 and Christopher Gallagher the Merseyside Report in 1994. 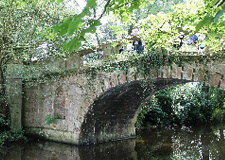 In all over 930 parks and gardens have been identified, and Lancashire Gardens Trust aims to survey and research these sites in more detail. Some have already been wholly or partly ‘lost’, but they can be fully recorded and information made available. 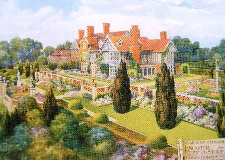 Arts & Crafts house and garden; an ornate stepped terrace gives views across pasture. 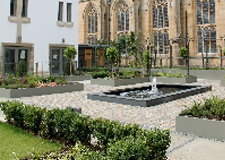 An enclosure between the cathedral and a new range has a 21st century interpretation of a medieval garden. The open square joins cathedral and town. A project for the Dean and Chapter completed in 2016 by Purcell with the landscape architect PlanIt. Arts & Crafts house and garden; an ornate terrace frames the house on two sides, a carriage drive and kitchen garden lie beside the other two. A Thomas Mawson design for Sir George McAlpine in 1900; the architect and Mawson worked together to make a complementary whole. A landscape founded in the Middle Ages; historic layers are visible from 1720, from 1804 and from the Edwardian era. Painted by JMW Turner. Home of the Parker family since the earliest records. 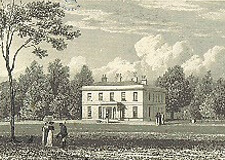 Sir Jeffry Wyatville altered the house and possibly the landscape for Thomas Lister Parker in 1804. A model textile community based on a cotton mill, chapel, cottages and temperance hotel. All sit beside the river Calder. Built in 1835 for Quaker manufacturers R & J Jackson. 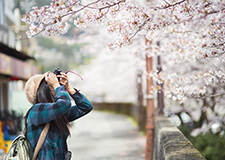 A park in the natural style with sinuous lake, winding approach, copses and ribbons of trees. C19 plantations, stables and walled garden. A design possibly by William Emes (1729-1803) for the Fitzherbert family, still in residence. 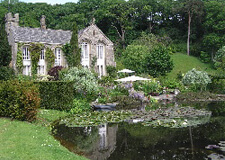 An Arts & Crafts house and garden; the ornate, stepped terrace overlooks a wider landscape with stream and lake. A Thomas Mawson design for cotton manufacturer J. Barlow in 1912. 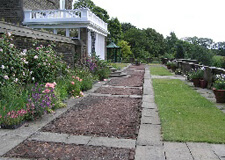 An extensive garden in the English classical style featuring many aspects of the designer’s art. A romantic streamside setting. 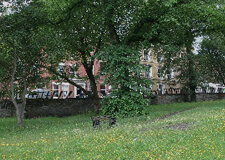 A Picturesque site of c.1805 now developed in great beauty by award-winning designer Arabella-Lennox-Boyd. A lavish stepped terrace in limestone incorporates a wall fountain, loggia and rose garden. An L-shaped pergola leads away from it, with views to the sea. A Thomas Mawson design for the Sharp family in 1920; an older house was re-modelled in Italianate style to complement the garden. An estate created in a steep valley, planted to afford walks in the plantations and across the stream in Picturesque style. Created by Dr. Thomas D. Whitaker (1759-1821), antiquarian and author. He probably introduced the artist JMW Turner to Lancashire. A C12 castle stood on this hilltop to command views over the river Lune. Each century has seen additions to this dramatic site, painted by Turner. 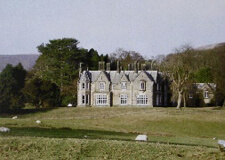 Seat of the Lords of the Manor of Hornby and Tatham. 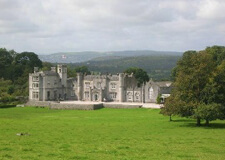 In C19 the architects Paley & Austin extended the castle and terrace. A Picturesque landscape of plantations, walks and pasture with views to the river Hodder. 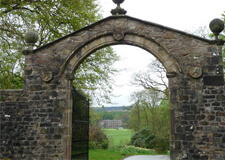 Estate created in 1805 for J. Peel, manufacturer, son of Sir Robert; a new house was built in 1845 with stables and walled garden. A Picturesque landscape of pasture and plantations; the limestone hall in gothic style lies in a bowl with a backdrop of Cumbrian mountains. Records survive from 1246; George Townely built a house in 1763 and probably laid out the park. The Gillow family, of furniture fame, have resided here since 1822. 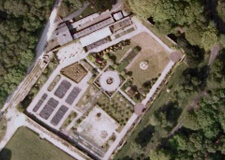 A deer park overlaid by a landscape park and a later elaborate Victorian walled garden. 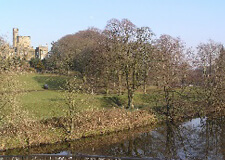 John Webb (1754-1828) designed the park in the natural style. 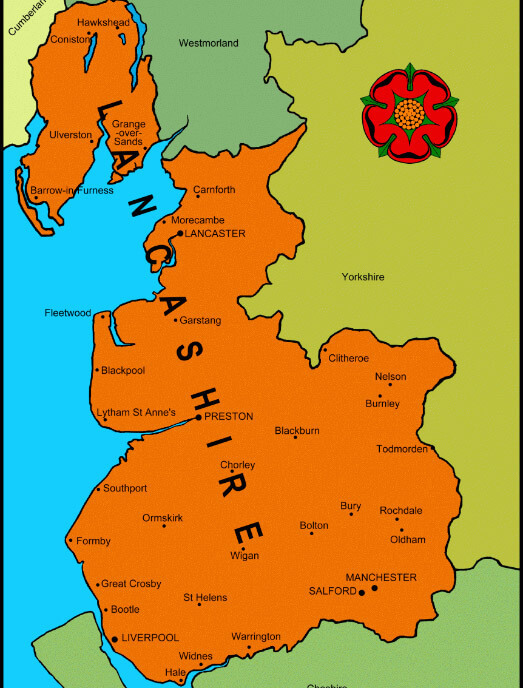 He had several Lancashire commissions. A deer park overlaid by a late C18 formal landscape with avenues in a patte d’oie. Natural-style landscaping did not eliminate all of it. C20 hospital gardens were elaborate and colourful. Plans of 1735 for the Hesketh family survive; Thomas Dalrymple Hesketh moved parts of Rufford village in late C18 to extend the park. A town designed around the river Tawd where compact urban and industrial areas are separated by green sites for recreation. In 1961 the site was chosen to relieve overcrowding in north Merseyside; Sir LH Wilson drew the masterplan, preserving the historic Ashurst Beacon. 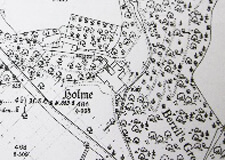 An early (1431) manor and estate overlaid by a C17 garden still in evidence. 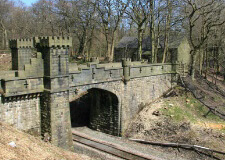 The railway company was required to cross the land via a tunnel (1847-8). Families associated include the Orrells, Humphry Chetham and James Kay, inventor of a successful process for spinning flax. 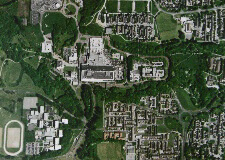 A combined design of buildings and landscape form a campus of linked courtyards and walkways. Messrs Bridgewater, Shepheard & Epstein collaborated on the layout in the early 1960s. 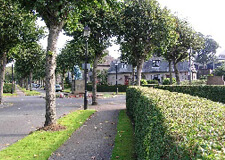 A community of houses lining radiating avenues, social centre, bowling green and (originally) workshops; a bronze statue stands at the centre as the memorial. 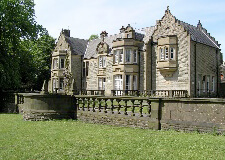 Designed and built by Thomas Mawson & Sons to Arts & Crafts principles 1922-4; funded by donation and lottery to house the returning wounded after 1918. 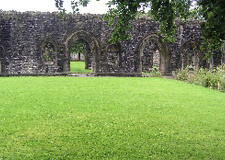 Abbey grounds lie beside the river Calder in the town. Founded in 1296, the buildings became the private dwelling of the Assheton family in Tudor times. 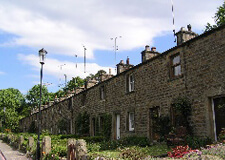 In C19 the Hargreaves, calico printers, adapted the precinct to a sublime Picturesque landscape. A remarkable surviving square surrounded by Georgian town houses; formerly arranged in narrow plots and now one open space. 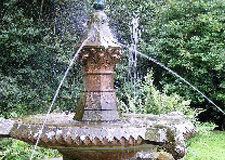 Begun in 1799 by W. Cross and modelled on squares in London and Bath. Residents have recently promoted its restoration. Mid-Victorian sporting estate and home farm, with remains of extensive glass-houses; wider parkland and arboretum. Former parterre in Italianate style. Purchased from the Duke of Hamilton in 1853 by P Ormrod, cotton spinner. House in gothic style by E Paley. 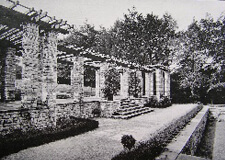 Send us your recent or old photographs of parks or gardens on the list se we can put them online. 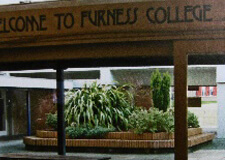 Can you remember visiting them in their ‘heyday’ – send us your memories. Do you own or have an interest in one of the sites? Or perhaps you belong to a ‘friends of group’. If so then get in touch we would love to hear from you.